Summary: You’ll get all the big benefits of a home exercise bike, with a far more comfortable sitting position with the JLL RE100 Recumbent bike. JLL are big players in this space. They make two of the best-selling upright bikes (the 300 and 200). Their reputation was built on solid, reasonably priced exercise equipment. This model ticks all the right boxes with a solid base, great electronics and a budget level price. It is ideal for those starting their fitness journey, and for anyone that values comfort while they burn some calories! Check out the detailed picture gallery, and feedback from people who bought it on this dedicated amazon.co.uk product page. The unit with the pedals includes a 5kg flywheel and has 8 levels of magnetic resistance. Magnetic resistance is a plus point – it is smoother than manual resistance. The pedals have grips to stop your feet slipping, and straps to keep your feet in place. While you will not get a full colour, programmable unit at this bargain price level – there are some plus points with the console. This tracks everything! You’ll find your speed, distance travelled, calories burned and even your pulse rate on display. Your pulse rate is measured via sensors in the handlebars. You can see in the gallery that these are situated just below the seat. Note that the display is in kilometres, and not miles! Some assembly is required, though the main unit is already put together. Smaller people should have no problems (5 feet was specifically mentioned in the questions). There is a maximum listed user weight of 100kgs, which is around 15 and a half stone. It also comes with a 12-month warranty, and of course, JLL has a great reputation for service. Words that appear over and over in the comments from previous buyers are ‘comfort’ and ‘sturdy’. Overall people are very happy with this machine. The exceptions (1 and 2 stars) are for faulty units, which should be under the 12-month warranty. One commenter found that he was pedalling at 90 miles an hour. Those faults aside, the seat with a back rest came in for repeated praise. Some people were surprised how vigorous a workout they could get while in this position. This is a bargain priced item. Often in this price range, people complain about flimsy or rattling equipment… In this case, the feedback is way more positive. Check it out for yourself via amazon.co.uk! Wrap Up: Is a Recumbent Bike Right for You? Budget price, JLL quality and a comfortable padded seat – what more could you ask for! This is ideal for those starting their fitness journey, or looking for something comfy to get them peddling regularly. If you are a serious athlete, you’ll probably want a more pro-level machine. JLL has a solid reputation for service (after sales) and quality products. 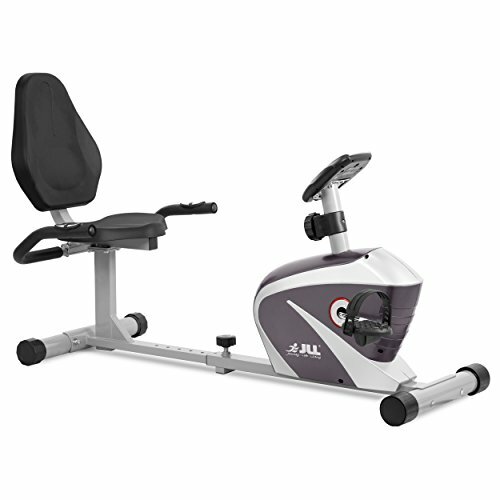 A look at the feedback and spec, compared to the price point will show you that the JLL RE100 Recumbent Bike is a worthy best-seller. Check out the gallery and feedback for yourself now on this dedicated amazon.co.uk product page.